DUBAI, UNITED ARAB EMIRATES--(Marketwired - Dec 7, 2015) - The holiday season is a time for pulling out all the stops, for slowing down and for showering your nearest and dearest with their favorite things. And this year, doing all of that is as easy as booking a reservation at one of the many festive celebrations planned at the JW Marriott Hotel Dubai. With some of the best restaurants in Deira, Dubai, the hotel is perfectly poised to offer an unforgettable repast over the holidays. Whether you crave a romantic Italian dinner, a sumptuous buffet of international flavors or a traditional four-course dinner, the JW Marriott has the event for you. Can't decide between Bavarian fare and Asian delicacies? Enjoy it all and then some at one of the hotel's legendary Dine Arounds. 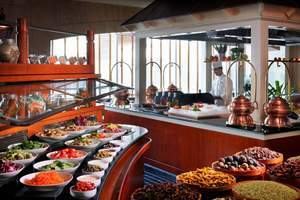 Available on Christmas Eve, Christmas Day for brunch, New Year's Eve and New Year's Day for brunch, each Dine Around features buffets and live carving stations at The Market Place (international fare), Bamboo Lagoon (Polynesian and Thai cuisine) and Hofbräuhaus (Bavarian specialties). Live entertainment and, on Christmas and New Year's Day, a children's play area create a jovial atmosphere for the whole family. Prices start at AED 550 on Christmas Eve, Christmas Day and New Year's Eve. Prices start at AED 295 on New Year's Day. Embrace the spirit of la famiglia over a three-course set menu at Cucina this holiday season. Exposed brick, an open kitchen and the pervasive aromas of tomatoes, olive oil and oregano evoke the essence of Italy in Dubai. Guests can savor authentic Italian fare at this restaurant on Christmas Eve and New Year's Eve with three-course set menus. Prices start at AED 350 for two guests on Christmas Eve, and at AED 525 for two (includes wine) on New Year's Eve. Prices start at AED 650 for two guests on Christmas Eve, and at AED 750 for two (includes champagne) on New Year's Eve. Continue the celebration after the plates are cleared by indulging in the comforts of the hotel's 351 guest rooms and suites. As one of the most luxurious hotels near the DXB Airport, the property features marble bathrooms with upscale spa amenities, plush bedding, international satellite cable service and high-speed Internet access. The result is a holiday season where you can receive as much pleasure as you give. Located just 10 minutes away from the airport, the award-winning JW Marriott Hotel Dubai offers elegant guest rooms, a location in the heart of the city's business district and luxurious amenities like a full-service spa and health club. The property's more than 31,000 sq. ft. of event space is complemented with state-of-the-art audiovisual services, on-site business services and an experienced staff of event planners for seamless meetings and spectacular weddings. The rooftop pool, 10 restaurants and enviable address near both major businesses and cultural attractions like the Dubai Spice and Gold Souks make this hotel an unparalleled choice in a city known for its opulence. JW Marriott is part of Marriott International's luxury portfolio and consists of beautiful properties in gateway cities and distinctive resort locations around the world. These elegant hotels cater to today's sophisticated, self-assured travelers, offering them the quiet luxury they seek in a warmly authentic, relaxed atmosphere lacking in pretense. JW Marriott properties artfully provide highly crafted, anticipatory experiences that are reflective of their locale so that their guests have the time to focus on what is most important to them. Currently, there are 70 JW Marriott hotels in 26 countries; by 2020 the portfolio is expected to encompass more than 100 properties in over 30 countries. Visit us online, on Instagram, Twitter and Facebook. The holiday season is a time for pulling out all the stops, for slowing down and for showering your nearest and dearest with their favorite things. And this year, doing all of that is as easy as booking a reservation at one of the many festive celebrations planned at the JW Marriott Hotel Dubai.